Discussion in 'JS Plugin Releases (RMMV)' started by Melosx, Oct 5, 2016. I asked for this previously but then I said "Meh, is better if I do this myself" and... ta-dah!! This plugin allow you to add new categories in your inventory. 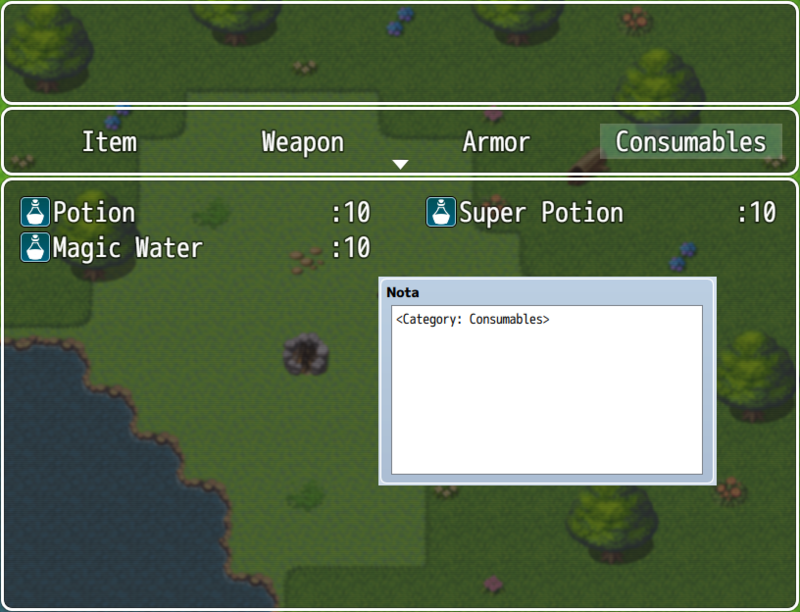 Also provide a notetag to set the correct category for items, weapons and armors. Add a new layer in the Item Menu. - Default Items command now contain the list of all categories related to Items. - Default Weapons command now contain the list of all categories related to Weapons. - Default Armors command now contain the list of all categories related to Armors. The ID (1 to 50) of each category you want in the relative sub menu. Hide the category X if no items inside.
! X is the ID (1 to 50) of the category ! If default command are hidden or Two Level Menu is enabled all uncategorized item aren't shown in any list. Where X is the name of the category you want the item. Improved control of each category (up to 50). Can hide category if is empty. This new version change how the categories are read from the plugin. Each category have is own setting for "Name" and "Hide if Empty" param. Change the way the categories are read by the plugin. Can now have category names with more than one word. Game freeze caused by onSellCancel function. Game freeze caused by onItemCancel function. Actor window now appear correctly over other windows. - Free for use with both Free and Commercial Projects. - No problem with YEP_ItemCore. Tetsune, styx92, jordanblake and 7 others like this. Ah, I've been looking for something like this for awhile now. Thanks so much! What are your terms of usage by the way? EDIT: Hm, it shows undefined when I go to the item menu with Yanfly's Item Core script. I even tried it on a blank project with just Yanfly's Engine and Item Core script and got the same thing. Can I see a screenshot of your Plugin Manager config? Yep, that fixed it, thanks! In the future it might be a good idea to upload the plugin somewhere if it requires a specific name. Sorry to bother you again, but I have another question. Would it be possible to make it so that you can categorize weapons and armors as well? It seems to only work with entries in the items tab. - Default categories Items, Weapons, Armors can now be hidden. - Default category Key Items is is always shown, at the end of all categories. Encountered a bug with two level menu. The game freezes when you select a category and try to exit. Thanks! Will keep you updated if I find any more bugs. Is it possible to have the categories separated if they have an overlap with each other between items, weapon and armor? Example: Both weapon and armor have a category called Common, which are vendor-obtained items. A Longsword is a Common, but it will show up in either categories regardless if it was an armor or not. Additionally, it appears that while selling, if you enter the category to sell something and cancel out, the category list is not disposed properly, even overlapping over the Item, Weapon and Armor selection which makes it look like the game froze. Seems the plugin doesn't like Yanfly's Shop Menu Core, as I get this error when I try to sell. I've pasted the error log from the console in the spoiler below if that helps. pixi.js:20314 Deprecation Warning: DisplayObjectContainer has been shortened to Container, please use Container from now on. Hi I really love this plugin so simple yet so need for simple customization. This may come of as bit rude however lines 139-141 which allow for the custom naming of categories are set up in a way that allows for only one word categories like "Food" or "Armor" but not for multi word categories like "Blacksmithing and Crafting". I recommend rectifying that by simple changing the the array separator form " " to ", " this way multiple word categories can be made. I agree with Zarsla on the being able to make category names more than one word. Overall, nice plugin though! After the update of the plugin edit Item Categories, Weapon Categories & Armor Categories and replace the space with a comma. I love this plugin. The inventory screen has bothered me for a while now and I love the layout this gives. I have a request. I'd like it so categories only show up if there are items in the inventory of that category. I have about 20 weapon types and the party will only start out with weapons from like 3 categories. Having 20 categories to sift through when there are only a few weapons would get really annoying for the player. Nice plugin! Is there a way for Key Items to not be a sub-category in items?